Visitors to the state of Washington often quickly become enamored with the beautiful landscape that traverses this part of the country. 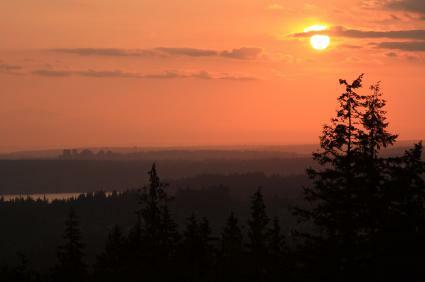 Hiking trails abound in and around Bellevue, Washington, and there is enough diversity for hikers of all levels to find plenty to satisfy their lust for the outdoors. Whether you're searching for a backpacking adventure or you simply want to spend a leisurely day with your family, Bellevue, WA has just what you are looking for. With trails categorized from easy to difficult, you're sure to find the perfect hiking adventure. Check out the following popular hiking trails in and around Bellevue. Cedar River Trail: With the trailhead located in the Landsburg Park area, the Cedar River Trail is approximately three miles in length and is classified as easy. Plan on spending one to two hours on this trail. Coal Creek Falls Trail: Another easy hiking trail near Bellevue, the Coal Creek Falls Trail can be accessed from Cougar Mountain and is 2.5 miles in length with an elevation gain of 350 feet. Mercer Slough and Bellefields Trails: Just minutes from downtown Bellevue, the Mercer Slough and Bellefields Trail is a little more than two miles in length and is classified as an easy hike. To access the trail, take I-405 to SE 8th Street exit, and turn west. Then, turn left on 118th. You'll see the Bellefields Trailhead on the right before crossing under I-90. Anti-Aircraft Peak Trail: Classified as a moderate level hiking trail, the Anti-Aircraft Peak Trail is six miles in length. The trail offers plenty of scenery along Cougar Mountain, and you'll find breathtaking views along the way, particularly when you reach the peak and witness Puget Sound basin far below. Wildside Trail De Leo Wall: This Cougar Mountain trail is approximately four miles in length and is categorized as moderate in difficulty. The trail can typically be accessed year-round. Wilderness Peak Trail: Located just minutes from Cougar Hill, this Cougar Mountain moderate level hiking trail offers plenty of variety along its four mile trek. The trail is dog-friendly and features an elevation gain of 1,200 feet. South Tiger Mountain: Classified as moderate to difficult, this 7.3 mile trail can be expanded to include a 16 mile loop which ventures over or near six peaks on Tiger Mountain. Because of this expanded loop, hikers might view this trail as difficult. It's accessible year-round. Tiger Mountain Trail: Those who want something a bit more challenging often head to Tiger Mountain near Mirrormont. The trail is 16 miles long with an elevation gain of over 2,000 feet, so it is classified as difficult. This trail is only open from March to November. The trail is long, winding, and beautiful. West Tiger Railroad Grade Trail: This 10-mile trail is also located on Tiger Mountain and follows the old rail line into some of the most remote areas of the mountain. The trail is accessible year-round and features an elevation gain of 1,600 feet. Stop along the way, and take in the spectacular views. Trails.com: Check out the many hiking trails in and around Bellevue at this website. AllTrails.com: This site lists its 15 favorite hiking trails in the Bellevue, Washington area. TrailSource.com: Find out information on forests and parks in the Bellevue area, and access printable trail information at TrailSource.com. BringFido.com: Not all trails are dog-friendly, but you can find out which ones are at this site. Check out easy-to-use maps and read trail reviews by fellow hikers. Yelp.com: Find out what outdoor enthusiasts really think of the hiking trails in the Bellevue area by reading the reviews and insider tips on this website. Washington Trails Association: Read trip reports and hiking blogs to find out the latest information from the Washington Trails Association. Continue to visit the above sites for updated information or read travelers' blogs to gain a more personal look at fellow hikers' adventures in the Bellevue, Washington area. Each trail has something special to offer, so whether you are searching for a fun day trek or you seek a more intense, backpacking adventure, you're sure to find something that is suitable for your outdoor needs.